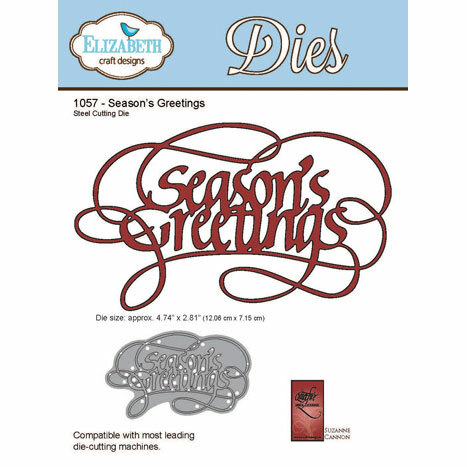 Welcome to our blog again today for another fun share using the new "Quietfire Designs Dies" by "Elizabeth Craft Designs". 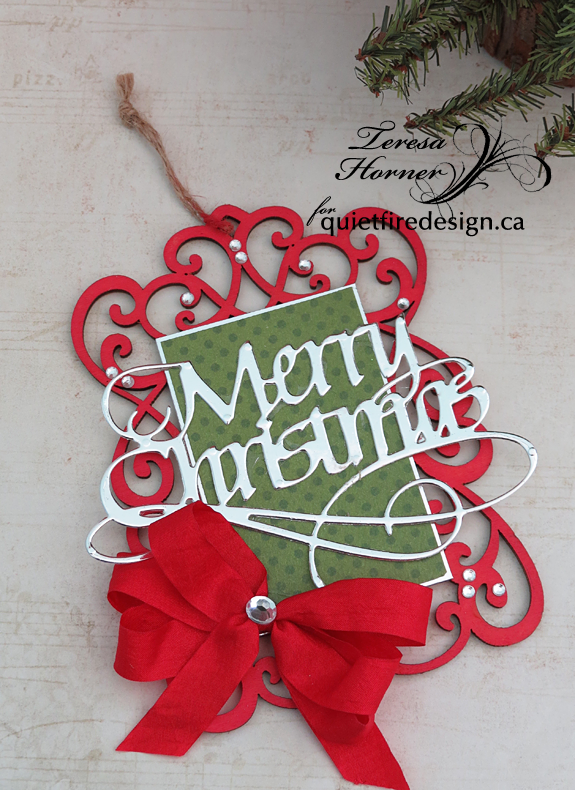 I went for a look to see what was new out for the holidays at my local craft store and found this cute tin ornament to decorate and also this lazer cut one so i thought i would see what i could come up with using the dies. The tin ornament was really fun and they come in different shapes so you could do lots of them to decorate. I chose this one because i thought my "Season's Greetings die" would look really nice across the center and i could put lots of things in the backround to decorate. The papers are from WeR and i picked it because it went great with the color of the metal. 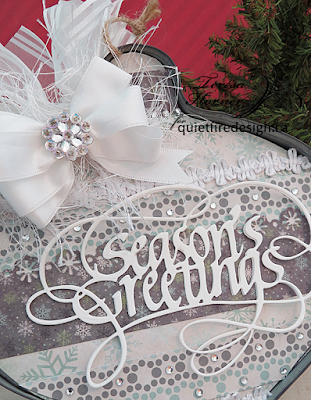 I really wanted to make the sentiment pop so i cut out 2 of the same in white and glued them together. This way it's really thick and it really shows up well. You could also cut thin cereal box cardboard and put that in the back to add more depth. It measures 5 1/2 x 5 1/2 inches just to let you know the size. And this ornament is a bit smaller and i inked the top and then put a clear coat of varnish over it to seal it. Then i cut a silver mat for the green center and glued that on. 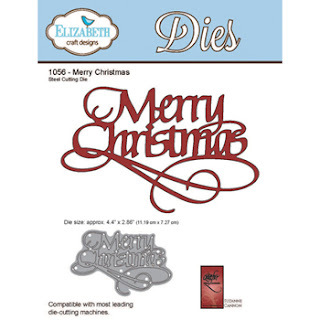 The "Merry Christmas die" I cut out of silver mirror cardstock and glued that on the top. 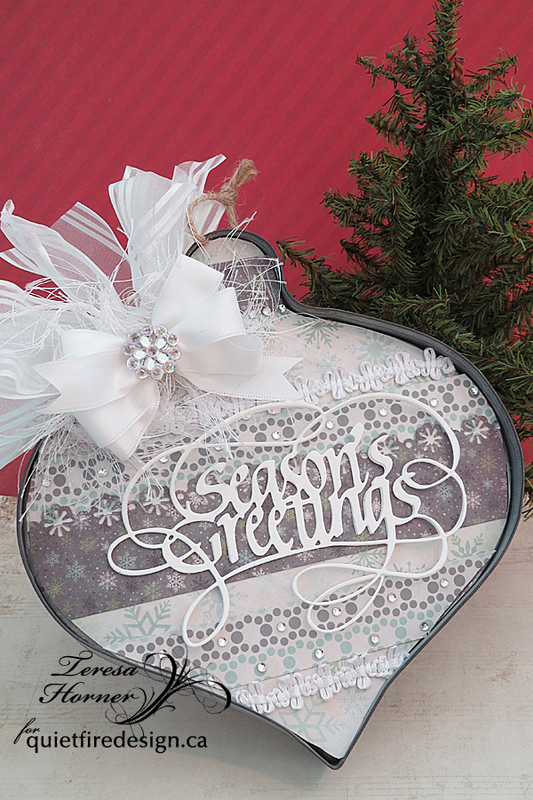 And I finished it with a bow and rhinestones in a few places to make it glisten when it's on the tree. 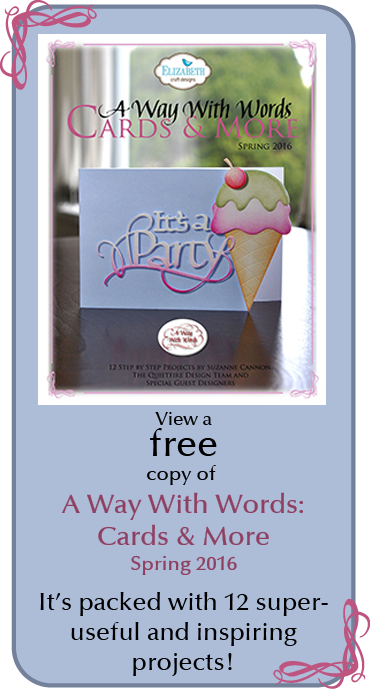 It was super easy and would be great to give as a hostess gift for your holiday party or for friends and family.